Congressman Joe Baca introduced legislation, "The Proud Act," to address Latino school dropouts and gang violence. WASHINGTON D.C. - Congressman Joe Baca was smiling broadly, his eyes flashing satisfaction, as he described Speaker Nancy Pelosi running across the House Floor to urge him to change his vote on a bill dear to Pelosi. Baca, the Chairperson of the Congressional Hispanic Caucus in 2010, was delivering a message to Speaker Nancy Pelosi: anti immigrant bills, such as the "English Only" bill that had passed uneventfully on the previous night are just as important for Hispanics. Baca's "Don't take us for granted" strategy worked. When Joe Baca was convinced that Nancy Pelosi understood the Hispanic Caucus's desire to defeat the "English Only" bill, he signaled a thumbs up to caucus onlookers throughout the floor. Immediately, green lights, signaling a vote now favorable to Pelosi, began lighting up the screen. Sun Tzu (Art of War) could not have done better. 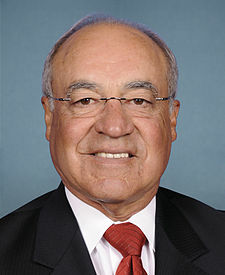 Rep. Joe Baca has served in Congress since winning his election in 1999. He represents the 43rd District of California, which consists of the cities of San Bernardino, Colton, Fontana, Rialto, and Ontario. Because his Congressional District is over populated, Congressman Baca's District is not likely to change with decennial redistricting. On January 11, 2011, Congressman Baca introduced HR 218, legislation that promises to stem Latino dropout rates and Latino gang violence, while achieving immigration reform in the same simple strategy. Both Latino dropout rates and gang violence have vexed Latino families for decades. Baca, a UCLA trained social worker turned politician, proposes using immigration reform as a societal tool for positive change. Employing the logic of Occam's razor, Baca's HR 218 opens a path for citizenship to immigrant youth who finish high school and stay out of trouble for six years, attend the sixth to the twelfth grade in the United States, apply for residency between the ages of 18 and twenty five, and have "completed a curriculum that reflects knowledge of United States history, government and civics." The criteria seem simple enough, but implanted within each criterion are partial cures for severe maladies plaguing the Hispanic community. Comparing the Proud Act to the more famous Dream Act, Congressman Baca explained that "college isn't for everybody. The Proud Act extends hope to those students who become good working people like beauticians, care givers, waitresses, day care givers, mechanics, drivers, plumbers, electricians, who graduate from high school and stay out of trouble. They deserve an opportunity." Growing pensive and showing his compassion, Baca argued that motivated to graduate from high school by the promise of a normal life out of the shadows, immigrant youth would remain in school to earn high school diplomas if the Proud Act becomes law. A high school diploma is an important criteria in identifying those most likely to escape poverty. According to the Bureau of Labor Statistics, in A Profile of the Working Poor, 2002 (September 2004), Hispanic women with less than a high school diploma were in poverty at a rate of 18.4%, compared with Hispanic men at 16.5%. However, among Latinos, high school graduates poverty rates declined significantly to 9.7% and 7.5% respectively. Similarly, the lure of gang life would be severely weakened when compared to the reward of citizenship for good character. According to Illinois Criminal Justice Information Authority, Hispanics were far more likely to be in gangs; however, persons with high school diplomas were far less likely to be in gangs. Sitting across the breakfast table from Congressman Baca, the Superintendent of Rialto Schools, Dr. Harold L. Cebrun Jr., and his Deputy Superintendent, Dr. James Wallace, observed that the Proud Act would be a powerful tool to transform the schools by encouraging good behavior and good performance in school. The Proud Act may eventually prove to be a tool of social change that extends far beyond immigration and deep into education. For Latinas, the Proud Act signals an avenue to citizenship that allows women to control their own destiny. Too often the path to a “normal” life forces Latina immigrants to limit their marriage choices to men who are citizens so that their lives and their families can be stable. Latinas have much to gain from the Proud Act. Nonetheless, the Proud Act faces a tough time in the newly constituted Republican House. In December 2010, a closely related bill, the DREAM Act passed the House with 216 votes, including only three Republicans, but in the Senate a majority of 55 votes including only three Republicans was insufficient to stop the Republican minority from killing the bill by filibuster. The Democratic majority is no longer present in the House for at least two years, and with the Republican’s persistant commitment to defeating legislation extending citizenship to Latino youth, there is little chance that the bill will reach the Senate, that is, unless Rep. Joe Bace can figure out another strategy to beat the odds. Congressman Joe Baca=s Washington Office can be reached at (202) 225-6161.